Let’s Toast to Thailand – The Land of Smiles! From sun-soaked beaches and picturesque islands to lush green mountains and colourful nightlife, Thailand has something for everyone. This Southeast Asian Kingdom is friendly and fun loving, gracious and accommodating. Thailand is the adventurer’s playground, the food lover’s heaven, and the shopper’s paradise. The traveller on a shoestring budget as well as the extravagant tourist can both have a fabulous time in this perfect tropical getaway. Toast to Thailand provides travellers with detailed practical information and offers suggestions to those wanting to make the most of their time in this amazing Southeast Asian country. To keep things simple, our Thailand travel guide has been divided in three sections. Depending on the stage of your journey, click on a section to get started. Our planning section includes details on currency exchange, the right time to travel, a Thailand packing list, basic Thai greetings and words, and a guide on tipping in Thailand. Tips on travel within Thailand, accommodation, shopping bargains, common scams and staying safe, costs, and other practical information is also given. Destinations provides information on the most popular places to visit in Thailand: Ayutthaya, Bangkok, Pattaya, Phuket, Krabi, Chiang Mai, and Koh Chang. Detailed and regularly updated information specific to these destinations, along with things to see and do when visiting, and favourite itineraries, are provided in this section. Spectacular treks, white water rafting, diving hotspots, snorkelling, mountain climbing, water sports, floating markets, Muay Thai, cooking classes, massages and full moon parties – the options are endless, but your time is limited. You’ll also get a flavour of one of the world’s favourite cuisines and exotic Thai fruits. 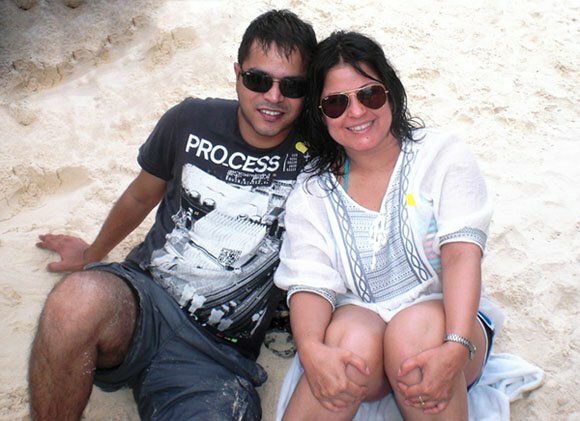 We (Mona and Paul) have explored Thailand 24 times during the last decade. Each trip has been unique, and as our understanding of Thailand has evolved so has our love grown for this proud Buddhist nation. Our Thailand travel guide is the result of extensive research and notes taken during our adventures in the country. The travel tips in our blog are for all travellers, but will work best for mid-range travellers and backpackers. Much of what we know now would have helped us immensely back when we started out. No matter what stage of travel you are at or what your preferences are, our practical tips and money saving suggestions will help you get much more out of your holiday. Someone said, ‘unlike paradise, Thailand is easy to get to’. I doubt that he had visited paradise but I liked the comparison, and he did make a point: Thailand is accessible. In fact, Thailand is so accessible that it is one of the most visited countries in the world! So how does a country with a population of 69 million, deal with 35 million visitors each year? Although the Tourism Authority of Thailand (TAT) has been doing an outstanding job at accommodating the influx of visitors, it hasn’t been able to keep up. Thailand’s popularity continues to soar and its infrastructure is now under pressure because arrivals from overseas has grown by nearly 2.5 times over the last decade. Tours get booked in advance, the transport system is under strain, and hotel occupancy is at its highest ever. Don’t get us wrong: Thailand still is an amazing holiday destination, but because its lures are no secret, it is turning into a slightly crowded version of paradise. You can, of course, get to a remote and non-touristy part if you prefer that. However, to make the most of your visit, you should begin planning your time in Thailand much before you visit.